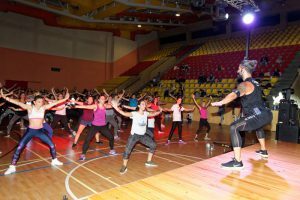 Organized by the Physical Education and Sports Center as part of the Sports as a Way of Life program, Zumba and STRONG by Zumba (SBZ) master classes took place on Tuesday, October 23 at the Main Sports Hall. 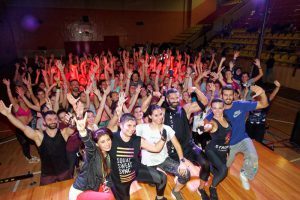 The Zumba class featured choreography by Yeliz Dingler, Aslı Yılmazkaya and Onur Sever, while the STRONG by Zumba class was led by SBZ master trainer İlker Dural, Ahsen Küçükdurmaz and Aslı Yılmazkaya. The event attracted around 250 participants, who had fun exercising to the accompaniment of the special light and sound system that gives Zumba workouts their distinct vibe. Students who took part in the class earned points for their Sports as a Way of Life “mountain groups”; those taking GE 250/251 also received 40 points for the course.